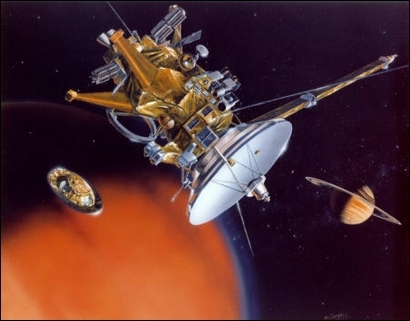 Cassini-Huygens is the 1st space mission dedicated to exploring Saturn and its system of rings and moons. One year ago today, Europe’s Huygens probe separated from the Cassini orbiter and landed on Titan, Saturn’s largest moon. What have its findings taught us about this tantalizing new world? Titan, Saturn’s largest moon, is unique in the Solar System. Studying it could shed new light on Earth’s past, and in particular tell us how the chemical composition of our planet’s atmosphere evolved. 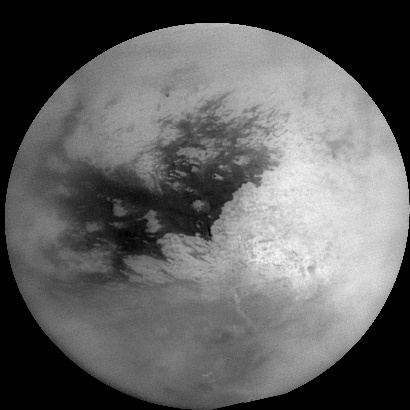 Titan’s thick atmosphere consists of several layers and, like Earth’s, is mostly nitrogen. On the other hand, it has no oxygen but large amounts of methane. In the outermost layer, ultraviolet solar radiation converts a small proportion of the nitrogen and methane into hydrocarbons. These hydrocarbons react with each other, again under the effect of UV radiation, to form aerosols that create an orange haze as they fall, masking Titan’s surface. Methane clouds, visible around the moon’s south pole, also give methane rain. 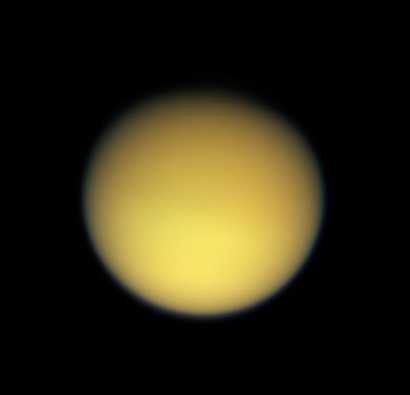 The ACP1 instrument on Huygens was able to precisely measure the chemical composition of Titan’s atmosphere, collecting and analysing a number of samples of aerosols during the probe’s descent. Nobody knew before Huygens landed on Titan on 14 January 2005,whether it would encounter a solid or liquid surface. 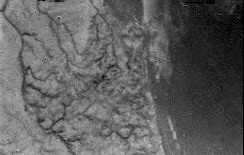 Pictures of Titan’s surface have unveiled a landscape of varied relief, with raised terrain sculpted by erosion —due to past or present flows— and lower areas similar to dried lakebeds. The erosion channels have been cut by a fluvial network sustained by methane rain. The probe landed in lower terrain where the surface appears to have the consistency of wet sand. This loose material is thought to consist of hydrocarbon aerosols that fall from the upper atmosphere. This spongy layer’s “elasticity” could be due to the presence of liquid methane. The surface also seems to be dotted with blocks of water ice or “ice pebbles”. For methane to still be present in Titan’s atmosphere, there must be a source of “make-up” methane to compensate for the fraction trapped and converted into hydrocarbons. This implies a big subsurface reservoir of methane. Readings from the GCMS2 instrument indicate that Titan’s methane is probably generated by internal geological activity. Springs or “cryovolcanism” could be responsible for releasing liquid or gaseous methane at its surface. The Huygens probe hasn’t revealed all its secrets yet. Combined with those the Cassini orbiter is continuing to gather, its data still have much to tell us as scientists bring the face of Titan into sharper focus.